Quick tutorial that shows beginners how to remove the shortcut icons from Xfce4 Desktop in (X)Ubuntu 14.10, (X)Ubuntu 14.04. Xfce4 shows Home, Devices, Trash icons on desktop out-of-the-box. You can’t simply remove them from the right-click context menu. But it’s easy to hide or disable them via the Desktop Settings utility. 1. 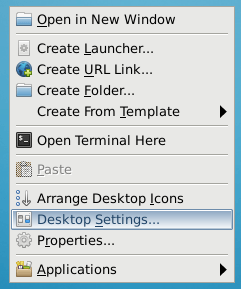 Open Desktop Settings from the Application Menu. Or right-click on desktop and select it from the pop-up context menu. 2. When the utility opens, navigate to Icons tab. Un-check all the boxes under Desktop Icons. Note that you might need to re-size the window so that you can see the checkboxes. This should remove user’s Home, Trash, and Devices icons. If you want to hide all desktop icons besides removing application shortcuts from ~/Desktops folder, just set Icon Type to None. Note that this also changes the desktop right-click menu. -Hiroshi Higashijima, Campbell, CA 95008 U.S.A.